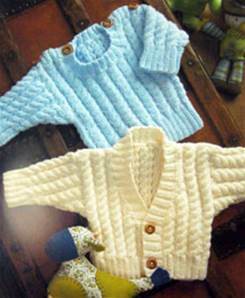 Cardigan or sweater: 31- 51cm 200g, 56-61cm 300g. Based on 100g balls baby DK. DK tension 36sts/ 30 rows to 10cm over pattern, 4mm needles. Suitable for any baby DK.3.25mm and 4mm needles, 1 st holder, cable needle. 4 buttons for sweater, cardigan 31-51cm 2 buttons, 56-61cm 3 buttons.